Information on health before pregnancy? Information on caring for a baby? Information on caring for young children? What does “inclusion” mean and how are the concepts of inclusion applied in our day-to-day work with First Nations, Métis and Inuit families? How can we make practices, programs and policies more inclusive of all people we serve, given the diversity of cultures, experiences and needs? 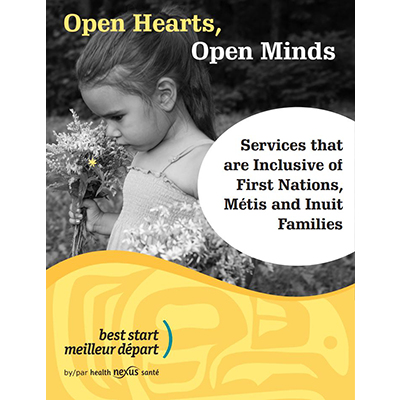 This report shares how, with an open heart and open mind, you can positively influence the inclusion of First Nation, Métis and Inuit families in services. It provides key concepts and approaches for being inclusive. An overview of Canada’s history gives a cursory background as to why Aboriginal peoples have been excluded and marginalized from services. The report shares insights on inclusive strategies, policies, hiring practices, attitudes, spaces and relationships. Cultural context and cultural safety must also be taken into account. The report also provides information on how you can determine needs and on how to engage and retain Indigenous families in services. This website has been prepared with funds provided by the Government of Ontario. The information herein reflects the views of the authors and does not necessarily reflect the views of the Government of Ontario. Resources, websites and services mentioned are not necessarily approved or endorsed by the Ontario Government or the Best Start, Health Nexus.